Mary Ann Hawkins was born to Adolf and Agnes Wesely November 1st, 1935, on their family farm south of Cedar Bluffs, NE. She passed away January 29th, 2019 at Heritage Legacy Assisted Living in Omaha, NE at the age of 83. Attending grade school at a nearby country school, she graduated from Cedar Bluffs High School. She then attended Midland College where she met her husband Swede Hawkins. They married June 4th, 1955. After finishing school in Fremont, they moved to Creighton, NE for 8 years. While in Creighton Mary Ann substitute taught and was involved with Campfire Girls. They moved to Oakland, NE in 1965. 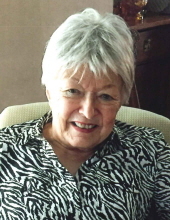 She was a busy homemaker and was involved with the United Methodist Church as a piano player, church secretary, summer Bible school teacher and helped with funeral receptions. For many years she worked as an election poll worker, volunteered for Meals on Wheels, was involved in the Cub Scouts, and taught preschool. She had a love for painting; she won best of show several times and helped paint the original Swedish signs in Oakland. A donation to the Oakland Public Library or the First United Methodist Church in Oakland would be appreciated. "Email Address" would like to share the life celebration of Mary Ann Hawkins. Click on the "link" to go to share a favorite memory or leave a condolence message for the family.